It could start at the age of 40 when most of us will notice that focusing becomes difficult for close up objects. This is due to the hardening of the lens inside our eye, a perfectly normal condition called Presbyopia. In the beginning we will compensate by holding the reading material further away. For me I started having difficulty focusing when reading later in the evening in my mid 40s, and eventually my arms weren't long enough. Do You Take Reading Glasses On The Water? Having to carry reading gasses out on the kayak for those times that you have to re-tie a hook or undo a bird's nest in your bait caster, is just another inconvenience while we are out on the water. If you are wearing sunglasses, you have to take them off and put them down, hopefully not lose them, and then dig up the reading glasses, re-tie or undo a bird's nest, and then put them away, hopefully find your sunglasses from where you put them down, and then probably have to clean them because you handled them. After becoming a Hobie Fishing Team Member in 2012, I was given the opportunity to purchase Hobie Polarized Sunglasses. I saw that they carried readers at 1.5, 2.0, and 2.5. Having discovered Maui Jim Sunglasses about 7 years ago I grew to like a nice pair of polarized sunglasses and the Hobie Polarized Readers didn't disappoint. I no longer have to carry reading glasses with me when I go out fishing. The glasses come in 3 models, Escondido, Rockpile, and Woody. I purchased the Escodido 2.0 strength. Takes a little to get used to, but the lens is still big enough that you eventually don't notice the line in the reader portion of the polycarbonate lens. 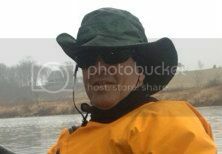 Richard Ofner started fishing in the fall of 2008 from a kayak, targeting all freshwater species. He has fished all over the Great Lakes Region from Lake Michigan, Lake Superior to the French River, and Bay of Quinte in Eastern Ontario. Taking advantage of all the opportunities Southwestern Ontario has to offer, Richard seeks out trophy Muskie, Walleye and Bass which can all be caught minutes away from where he lives. The last few years Richard has ventured into Kentucky, Louisiana, and Texas participating in several Kayak Fishing Tournaments. He has organized the Border City Classic, in Windsor, Ontario which has grown to become one of the Great Lakes Region’s largest Kayak Fishing Events. It is also one of the Hobie World Qualifiers since 2014. During the winter months where he can't get on the water he will do seminars, work fishing and boat shows, and write for blogs to help promote the areas vast resource of fishing opportunities and helping others to discover the sport of kayak fishing. Taking videos and pictures on the water of other people fishing in kayaks has also expanded into his kayak fishing experience. As a Hobie Fishing Team Member you may see Richard out in one of his Mirage Driven Kayaks mainly targeting Walleye, Bass, and Muskie, and will travel a few hours to target Salmon, Trout, and Sturgeon.